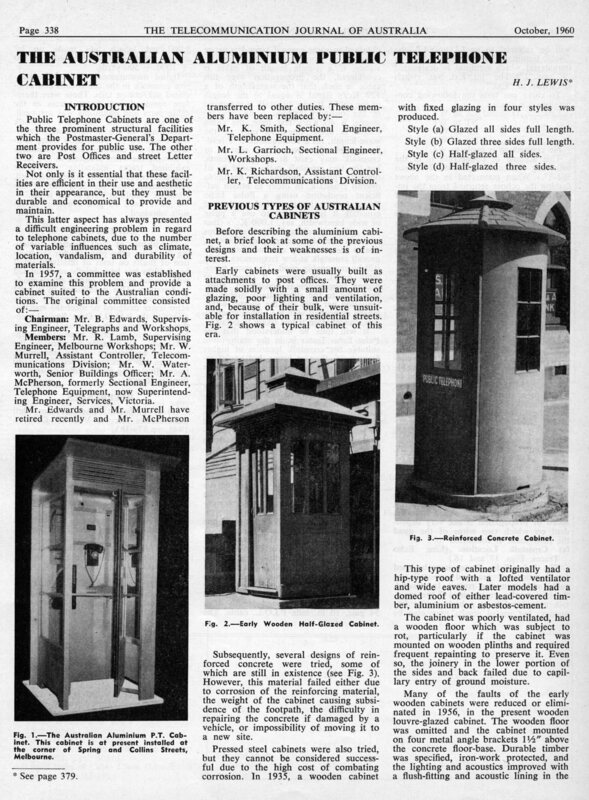 It is hard to believe that public telephone cabinets have been around since the First World War in Australia. 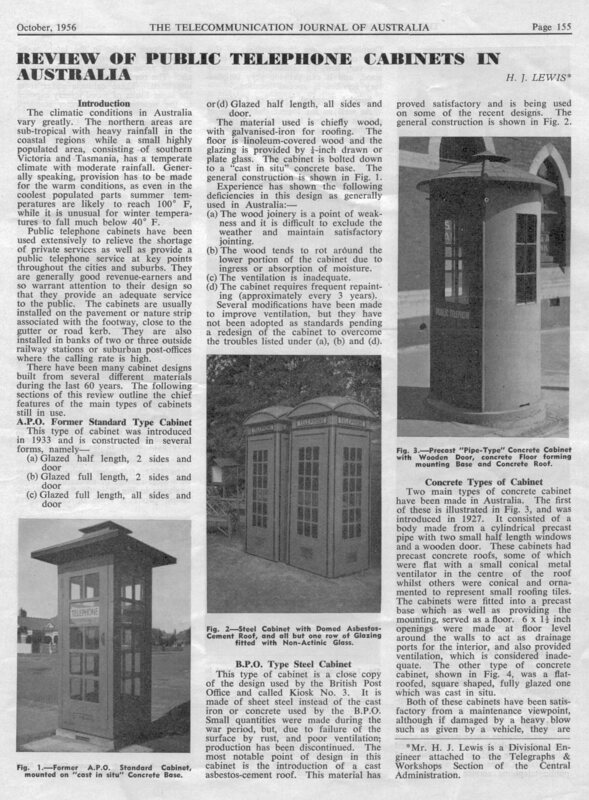 Before the ubiquitous mobile telephone, public telephone cabinets were situated in most popular city, metropolitan and country locations. They started as grand attachments to post offices and railway stations and transformed into practical enclosures sympathetic to climate, capital cost and maintenance. Both papers are written by Mr H J Lewis, a Divisional Engineer attached the Telegraphs and Workshops Section of Central Administration of the Postmaster General?s Department. 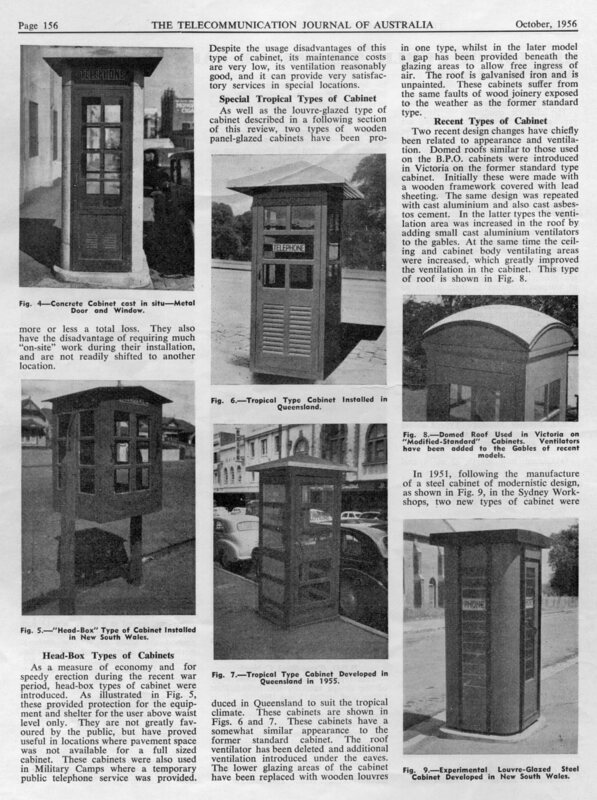 The first paper (TJA 1) provides a summary with photographs of the striking range of public telephone cabinets that were in operation in 1956 and summarises the desirable features of cabinets at that time. 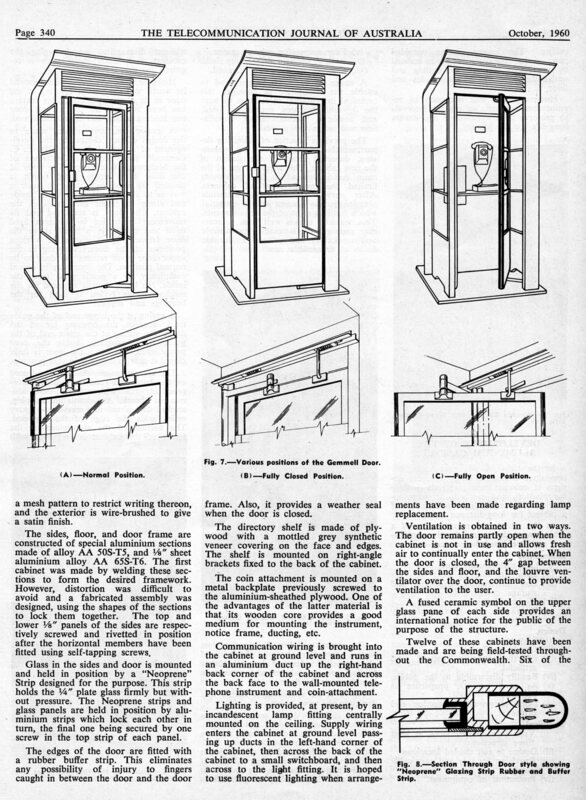 The second paper (TJA 2) from 1960 describes the development of the aluminium public telephone cabinet which was state of the art and had many advantages over its predecessors. Public telephones were deregulated in 1989 and are now supplied by Telstra and a number of other private companies. TJA 1 - Lewis, H.J. 1956. 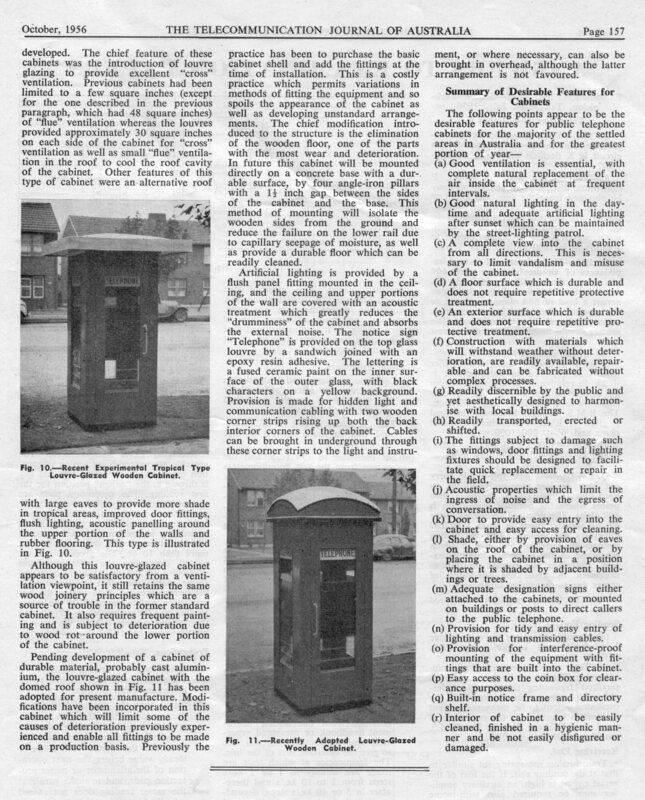 ?Review of Public Telephone Cabinets in Australia?, Telecommunication Journal of Australia, October 1956, Vol. 10, No. 5, pp. 155-157. 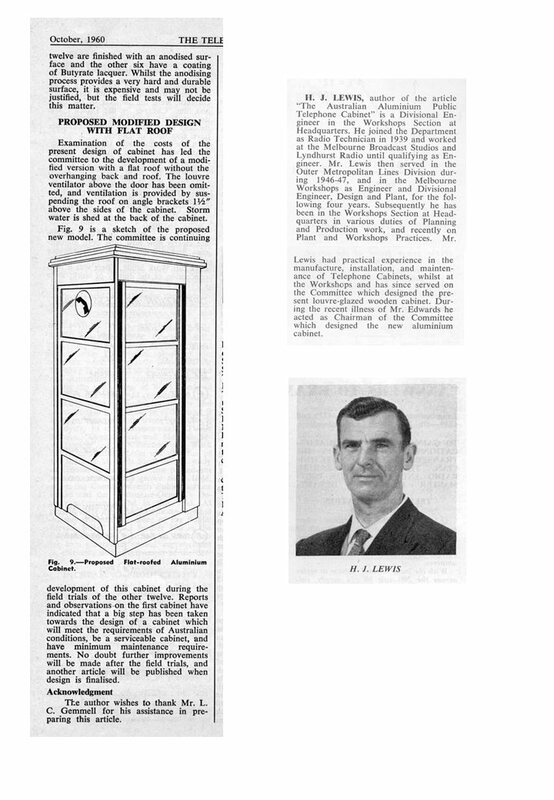 TJA 2 - Lewis, H.J. 1960. 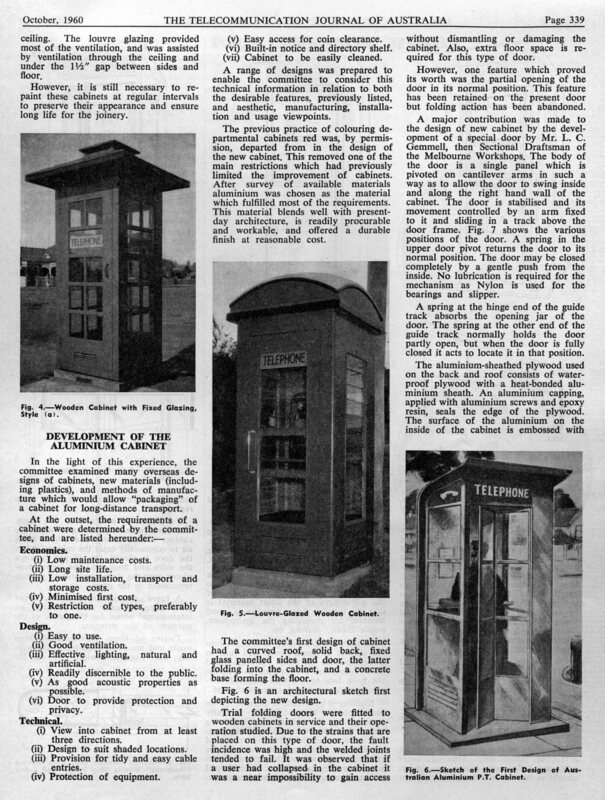 ?Review of Public Telephone Cabinets in Australia?, Telecommunication Journal of Australia, October 1960, Vol. 12, No. 5, pp. 338-341.